We are working in partnership with Urban Villages Initiative to develop a new and improved play area, and multi-use games area (MUGA), at the existing Rev. 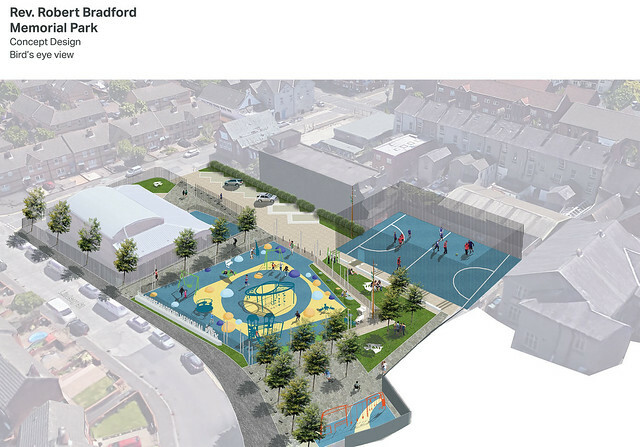 Robert Bradford Memorial play park, Donegall Pass. Work is underway, and is due to be completed by autumn 2019. The image in the gallery shows what the new facilities will look like. The revamped park will be a safe, shared space for everyone in the community of all ages and abilities. It will be a place to meet and enjoy a range of outdoor activities including sports and fitness, a place for younger children to have fun in the play park area, and an attractive meeting place for all. We held a public consultation in spring 2017 to get feedback on the initial plans for the redevelopment of the park. We received over 100 responses to the consultation survey from the local community, organisations and residents. Ninety-four percent of respondents supported our plans. As a result of the feedback we received we have made the following provisions within our plans. The park should be a place where everyone would like to spend some time. We have created a new open space at the Lindsay Street area of the site. We have also included new seating and lighting, and a selection of sensory and musical equipment will be scatted throughout the periphery of the play area and grass. The park should include an outdoor gym area. We have introduced parkour type equipment in an otherwise unused area of the site which should appeal to a variety of age groups. We want a better pitch/grass area. We will refurbish and upgrade the existing multi-use games area with new surfacing, improved fencing and lighting. The play park should include a range of new play equipment. We have included traditional play equipment and larger equipment, as well as new bright and colourful play mounds. The wide range of play equipment has been designed to support independent, inclusive and social play.